Albuquerque is home to the largest ballooning event in the world. From October 6, 2018 to October 14, 2018 our city will be hosting people from all over the world to witness this event and balloons will be filling the sky on most mornings. Many cats suffer from inflammatory bowel disease (IBD), and it is common for this condition to go untreated for years. Vomiting and diarrhea are never normal, and cats who suffer from one of these signs on a regular basis should be evaluated—even vomiting due to hairballs is not normal. Although hairballs can irritate the stomach, most cats with normal gastrointestinal (GI) tracts will process these and pass them in feces. Is Walking Your Dog a Challenge? We are blessed to live in a place where getting out for a walk with the dogs is a year-round activity. Now that the winds have died down a bit and the days are longer, I am seeing our clients and neighbors out enjoying the springtime mornings and evenings with their dogs. With the increased “traffic,” it means that our dogs are asked to cross paths with others more frequently, leading to more stressful interactions for owners of a reactive dog. If your dog finds sharing the sidewalk, median or path with others stressful or has “favorite” places on the route to release their inner Cujo (usually where there is another dog behind a fence), then you know the drill. I am the proud owner of two rescue dogs, one of which joined our family when she was about a year old. When we took her for her first walk I realized that we had a “project” on our hands, as she perceived every car, bicycle, skateboard, fire hydrant and four-legged creature a mortal threat. 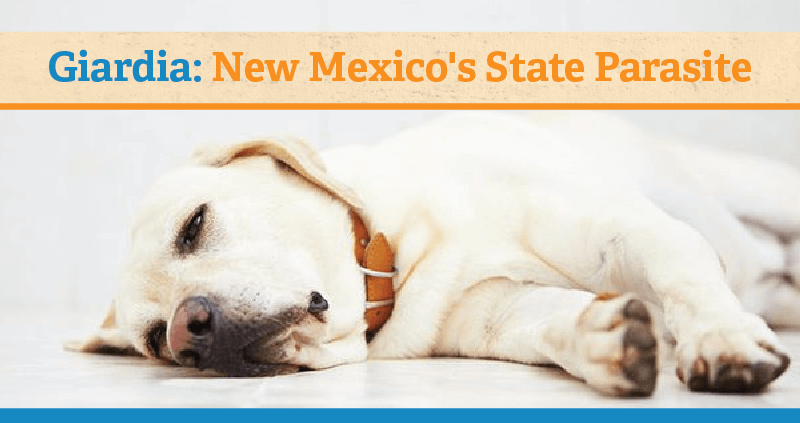 Giardia is by far the most commonly diagnosed parasite in New Mexico. It is diagnosed in both cats and dogs and it can also infect people. In contrast to most intestinal parasites (roundworms, tapeworms) Giardia is not visible to the naked eye. Pets usually acquire Giardia by ingesting the cysts from contaminated water. Clinical signs range from significant diarrhea to no signs at all. The life cycle of Giardia includes two stages. Usually a dog will ingest cysts in contaminated water or directly from the feces of another animal. Once the cysts are ingested and reach the intestines they transform into a fragile swimming form called a trophozoite which attaches to the lining of the intestines to feed. If enough trophozoites attach to the lining diarrhea develops (severity often correlates with the number of organisms present). As part of their life cycle the trophozoites produce very resistant cysts which pass through the GI tract and exit the body in the animal’s feces. Once the cysts are in the environment the cycle begins anew once they are ingested. incidence of feline kidney disease. maintaining your cat’s oral health to help stave off kidney disease. At Aztec Animal Clinic, we take dental care very seriously and a careful examination of the mouth is an important part of cats’ yearly wellness care. Proper management of periodontal disease requires at home care and, as needed, anesthetized dental cleanings and assessments. This is especially true for senior cats. Halitosis or bad breath is a common sign of periodontal disease, but disease can be relatively advanced before this develops. It is important to remember that kitties are great at hiding their pain and discomfort, so yearly exams at minimum are required to ensure that a painful dental condition has not developed. Kidney disease can cause many signs in your kitty, but early changes such as mild weight loss and subtle increases in thirst and urination can be difficult to detect at home. An exam and routine lab analyses will readily detect kidney disease in affected cats. Both periodontal disease and chronic kidney disease can be effectively managed once diagnosed. appointment online or by calling 505-265-4939. Good Times for All at the Aztec End of Summer Picnic! The team at Aztec Animal Clinic works hard year-round to provide your pet with exceptional care, so before the summer got away, we wanted to have some fun with our co-workers and loved ones. On Saturday August 26th, the staff and their families, friends, and four-legged companions gathered for good eats and good times at a local park. Enjoy the pictures and see if you recognize our team members when they’re not wearing lab coast and scrubs! 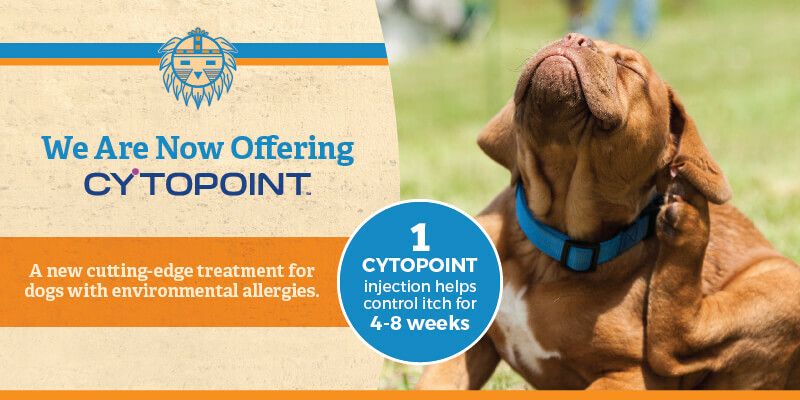 We’re excited to announce we’re now carrying Cytopoint (Lokivetmab), a new cutting-edge treatment for dogs with environmental allergies (atopy). Cytopoint is an injection that targets the inflammatory pathway that triggers the itch response, stopping itching at its inception. This treatment has an excellent safety profile, and side effects are rare. Most dogs with environmental allergies show improvement for 4 to 6 weeks with each injection. This gives the skin a chance to heal and in general helps itchy pets feel a lot more comfortable. Cytopoint is a great new option for dogs with seemingly uncontrollable allergies and for dogs experiencing unpleasant side effects from their current allergy therapy plan. Schedule an appointment at Aztec Animal Clinic to learn more about Cytopoint and how it can help your pet. 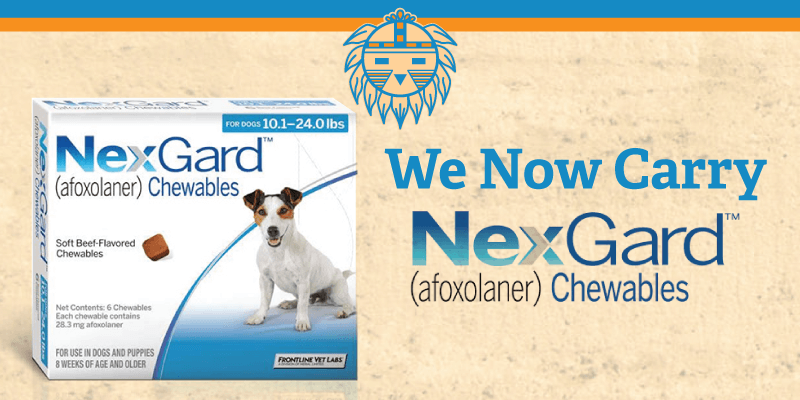 Aztec Animal Clinic now carries NexGard! NexGard is a tasty beef-flavored chewable that protects dogs from fleas and ticks for 30 days. Because the tablets taste so good, they are easy to administer. Dogs eat them up like treats! You won’t have to fight your pups to apply topical medications anymore. All in all, it’s a safer, easier and more effective way to protect your dogs from nasty pests than any option we’ve seen before in veterinary medicine. To order your pet’s preventative medications, call Aztec Animal Clinic at 505-702-8521. Heartworm is a nasty disease affecting our pets, and mosquitoes transmit it from pet to pet. As the name suggests, heartworms live in the heart, and they can also thrive in the lungs and blood vessels. Because they constrict blood flow, they can damage internal organs and cause lung disease and heart failure. Administering monthly oral or topical heartworm preventative medication year-round is your pet’s best defense against heartworm, and annual heartworm tests verify that the medication is working. We have many different types of heartworm preventatives available at Aztec Animal Clinic, and your veterinarian can help you decide which one is best for your pet. If you’d like to learn more about heartworm disease and how you can prevent it, schedule an appointment at Aztec Animal Clinic by calling 505-702-8521. Dr. Blossom is thrilled to be part of the Aztec team. She was born and raised in Los Alamos, attended Colby College in Maine for a BA in Biology, then went to Colorado State University for her DVM, graduating in 2009. She completed a 1-year internship at Atlantic Veterinary College on Prince Edward Island, Canada and then practiced in Santa Fe for 6 years before joining Aztec Animal Clinic. Her special interests include ultrasonography, arthritis & pain management, cardiorespiratory disease and feline internal medicine. She has 7 years of experience treating exotic animals and greatly enjoys the opportunity to provide medical care for these unique creatures. She approaches all of her patients with friendship and flexibility. She enjoys partnering with owners and using thoughtful communication to help achieve great care. In her off time, Dr. Blossom enjoys her family, running in the Sandias with her dog Scarlett, making gourmet ice pops, and participating as a leader in organized veterinary medicine.